Few other nations have undergone as profound a change in their social, political, and cultural life as Mongolia did in the twentieth century. Beginning the century as a largely rural, nomadic, and tradition-oriented society, the nation was transformed by the end of this century into a largely urban, post-industrial, and cosmopolitan one. 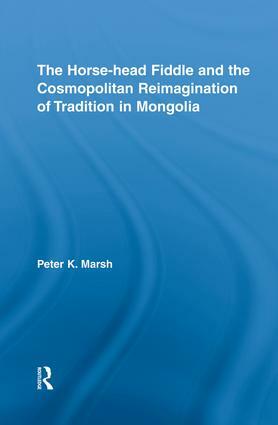 This study seeks to understand the effects that Western-inspired modernity has had on the nature of cultural tradition in the country, focusing in particular on development of the morin khuur or "horse-head fiddle," a two-stringed bowed folk lute that features a horse’s head carved into its crown. As well as being one of the most popular instruments in the contemporary national musical culture, it has also become an icon of Mongolian national identity and a symbol of the nation’s ancient cultural heritage. In its modern form, however, the horse-head fiddle reflects the values of a modern, cosmopolitan society that put it profoundly at odds with those of the traditional society. In so doing, it also reflects the cosmopolitan nature of the nation’s contemporary national musical culture.